The perfectly round buds of 'Snow Day Surprise' Pearl-Bush become masses of pure white flowers in spring. 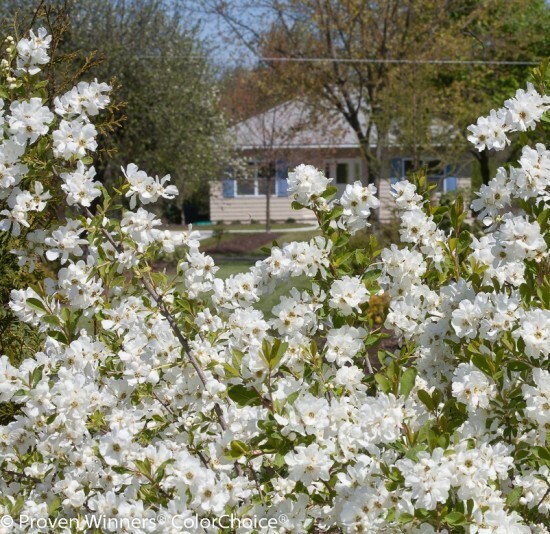 This is a stronger grower than old fashioned Pearl-Bush, with a neater, more compact habit. This is an excellent plant for the spring landscape! Pearl-Bush is easy to grow in average, well-drained soils in full sun to light shade. It prefers acidic, organically rich loams so will benefit from the addition of peat to the soil. It will perform best with regular watering, but established plants have some drought tolerance. Pearl-Bush flowers on old growth, so prune as needed immediately after flowering.